BBC reports on a cable break in the Mediterranean and that it "could have serious repercussions on regional economies." The subject of submarine cables is fascinating. Connection to a cable is crucial for participating in today's information economy. 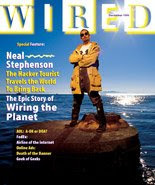 Interesting a rticle about the laying of cable written by Neal Stephenson that appeared in Wired several years ago. Unfortunately the link just has the text; I remember that the printed version had some interesting photos. Will blog on this more including submarine cable initiatives in Africa, access to cable and bits per capita measurements.